Clemco was founded in the USA in 1949 with the joint goals of providing revolutionary high-production abrasive blasting technology and of setting a new standard for product quality, maximum efficiency, operator safety and comfort. Custom-designed blast facilities are the optimum solution for large workpieces. Clemco staff methodically evaluates the exact requirements of each customer. Using this data, Clemco engineers design a system tailored to every specific of the job, taking into account each consideration of safety, efficiency and performance. The first priority is operator safety. Clemco CE-approved accessories protect the blast operator from excessive heat, cold, dust and noise; all irritants and safety risks are addressed. Protection in tandem with comfort is the focus of Clemco safety products to ensure the highest level of productivity. Clemco blast cabinets are ideal for the processing of small to medium sized workpieces. The sturdy yet compact design ensures that a minimum amount of space and resources are required for simple, convenient blasting. The Clemco features enable blasting with high efficiency and safe work conditions. Automated cabinet blasting offers distinct advantages for the processing of large-volume production runs and ensures accurate and consistently repeatable results. Clemco automated cabinets are designed to perform at peak efficiency while fitting seamlessly into a customer’s production line. The blast machine is the heart of the pressure blasting system. Attention to the proper configuration and compatibility of the machine’s components is crucial and ensures maximum blasting efficiency. Clemco products deliver high levels of reliability, longevity and safety in abrasive blasting. Pipe interiors are awkward to access, while demanding a high degree of surface cleanliness prior to coating. Clemco‘s pipe-blast tools combine total coverage of pipe interiors with precise and efficient performance. Clemco constantly improves the technology of blasting and coating pipe interiors to fulfill the highest demands. 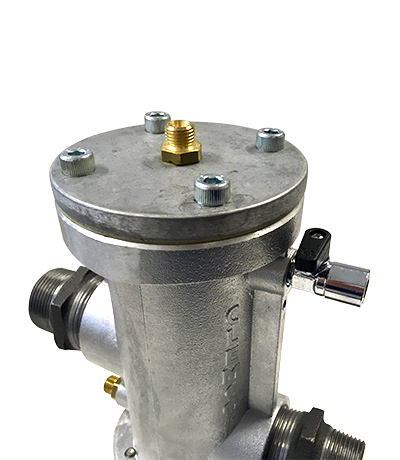 Clemco injector technology provides robust blast pressure despite low air consumption, through finely-tuned components assembled with skillful technical knowledge. The injector blasting equipment offers considerable surface coverage and long-lasting power, while keeping operation highly mobile and as simple as possible. These closed-circuit systems can be used to blast virtually anywhere. No elaborate containment or housing is needed. A closed-circuit blast system emits no abrasive particulate or dust and consumes a minimum amount of energy while maintaining the blast stream in a contained, safe pattern. Clemco possesses innovative thinking, expertise and the technical possibilities to meet the highly specific requirements on environment, safety and material.